Magnetite-series Paleogene granitoids of Mo-mineralized region of eastern Shimane Prefecture were studied chemically and compared with ilmenite-series granitoids of the Ryoke belt of the Chubu district. The eastern Shimane granitoids are divided into coarse-grained granodiorite and granite of batholithic bodies, and fine-grained granitoids occurring close to the roof-pendant. The fine-grained ones, varying in composition from quartz diorite to aplite are further subdivided into: Zakka and Kawai types, Rengeji type, leucogranites in the ore horizon, Yamasa type, Shimokuno type, and Ouchidani type. These granitoids are poor in A/CNK, Ga, Ga x 10000/A, K2O, Rb, Ba, Pb, CaO, Fe2O3, Zn, Y, La and Ce, and rich in Na2O, MgO, V and U, as compared with those of the Ryoke granitoids in the Chubu district. The chemical data indicate that the eastern Shimane granitoids are originated in source rocks with poor continental components, such as Al2O3, K2O, REE, and organic carbon. Some gabbroids which are high in Sr content and Sr/Y ratio may have been derived from slab-melting. Rengeji Older Granite is potassic being K2O>Na2O, and rich in La, Ce, Y, Nb, Th, U; thus continental in the source rocks. There occur small metamorphic bodies containing locally spinel and andalusite along the northwestern margin of the Rengeji Granodiorite. Kanenari hornfels is considered mainly psammitic with peraluminous layers. Togiishiyama hornfels has high A/CNK ratio but the K2O contents are normal as to the SiO2 contents. This rock contains rock-forming mineral of magnetite and has unusually high amounts of S, Cu, Pb, Zn and MnO. Therefore, the original rocks are considered intermediate to felsic tuffaceous sediments containing very little organic carbon. Mo-contents are high as 2.0 to 6.3 ppm Mo in average of the granitoids that host major molybdenite deposits, such as Kawai mingled rocks (Daito mine), Rengejileucogranites (Seikyu and Higashiyama mines) and Yamasa leucogranite (Yamasa mine). Therefore, trace amounts of Mo of fresh granitoids can be used as an exploration indicator. 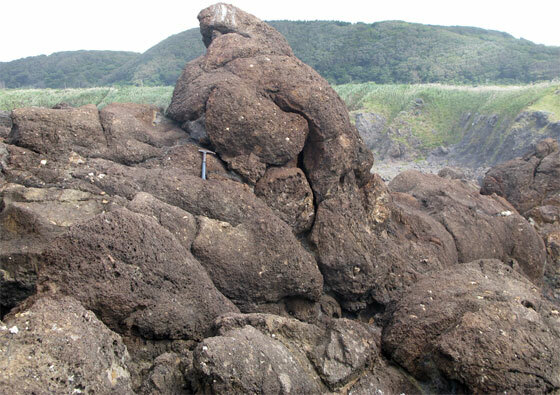 Kabuki Iwa (Rock) at the northwestern shore of Oga Peninsula is composed of Late Eocene basaltic andesite aa lava flows and pillowed lava flows, dacitic pyroclastic flows, debris flows and other epiclastic rocks. This close association of the subaerial and subaqueous volcanic products demonstrates a transitional environment between land and shallow water. NE-SW-trending parallel dikes and normal faults are also associated with these rocks in the surrounding areas, and the volcanic succession at Kabuki Iwa is interpreted to have accumulated in an extensional basin which slowly subsided with volcanism before the rapid opening of the Japan Sea.